Carol Ezovski from San Jose, CA, whose donation is going to Norcal GSP Rescue. Daniel Scott from Eureka, MO, whose donation is doing to Franklin County Humane Society. Each winner has also received the exclusive sterling silver Goodnewsforpets™ Heart-Paw charm and shelter donation in the Ceva “Dog Days” of Summer Giveaway! As part of its 15th anniversary celebration, Goodnewsforpets™ is partnering with Ceva Animal Health for our fifth of 15 giveaways. Ceva Animal Health and Goodnewsforpets aim to help your pooch enjoy a stress free and relaxing summer! This first kit targets potential stress a dog may exhibit during summer BBQs, fireworks, or thunderstorms. Ceva and Goodnewsforpets celebrate July with prize packs that are perfect for any pooch that needs a little help keeping calm during the summer excitement. 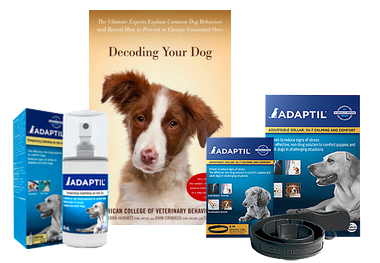 Ceva’s Summer Calm Kit for Dogs includes Adaptil® wipes, collar, spray & diffuser, as well as the go-to reference book for dog behavior Decoding Your Dog from the American College of Veterinary Behaviorists. For more on Decoding Your Dog check out the Goodnewsforpets ACVB column. The Adaptil line is an effective, non-drug solution to comfort puppies and adult dogs. Adaptil is easy-to-use and convenient for reassuring dogs during new experiences and fearful situations often associated with causing stress in our canine companions. The special scent (odorless to people and other animals) that Adaptil utilizes is a replication of the pheromone that mother dogs naturally emit to their puppies just after birth, to comfort them and reinforce the attachment between the mother and her offspring. The second prize pack offers solutions to keep your companion’s skin healthy all year round. Winners may choose from four DOUXO categories, to match their dog’s skin type: Allergic & Sensitive, Antiseptic, Greasy & Flaky, or Normal skin. The pack also includes a summer supply of Vectra 3D flea & tick ointment. This pack provides the essentials for a healthy and safe summer for any dog, both inside and out! The DOUXO line of products offers a large choice of formulations for all skin types, also with no-bathing options. 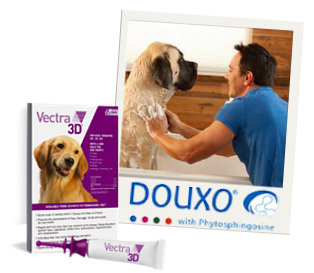 Vectra 3D products are available through a veterinarian and are fast-acting, long-lasting, and provide broad-spectrum protection. They repel and kill fleas, ticks, mosquitos, biting and sandflies, lice and mites (excluding mange mites). A single Vectra 3D application remains effective for one month, even after bathing and swimming. Do not use Vectra or Vectra 3D on debilitated, medicated, pregnant or nursing animals known to be sensitive to pesticide products without first consulting a veterinarian. Do not use on cats. 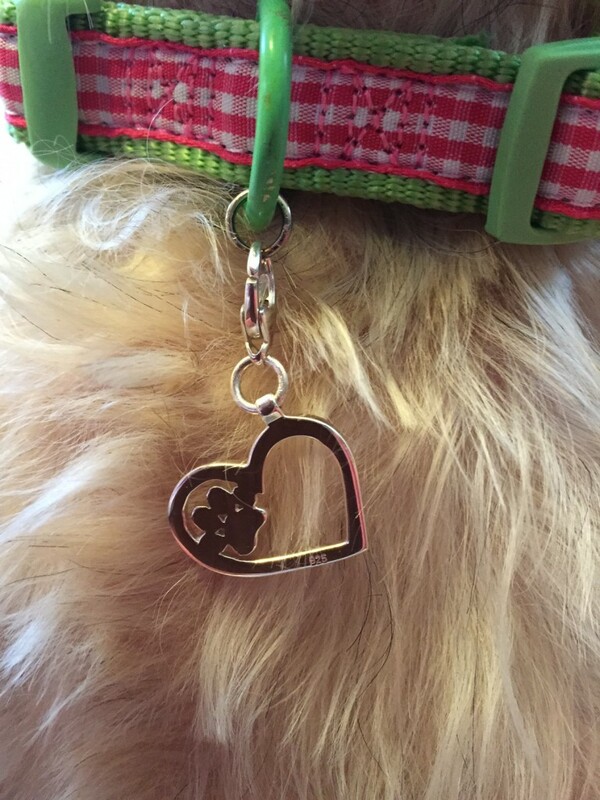 The exclusive Heart-Paw charm custom designed by Elena Kreigner for Goodnewsforpets. Modeled on a pet collar. The fifth contest in our Goodnewsforpets 15th Anniversary Contest Series to win a Ceva “Dog Days” of Summer Prize Pack, the sterling silver Goodnewsforpets Heart-Paw charm and a donation to a local shelter or rescue of the winner’s choice will commence June 26, 2015 and close July 22, 2015. Register now for your chance to win and share on your social media accounts using #GNFP15thAnniversaryContest! Watch for more 15th Anniversary contests on goodnewsforpets.com. For companies interested in sponsoring contests, contact Lea-Ann Germinder.